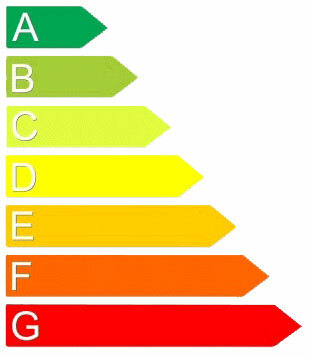 An EPC is a Certificate which states the energy efficiency of a building based on the standardised way in which a building is used. Commercial EPC’s have been a requirement since 4th January 2009. Scotland along with the other EU member nations have an obligation under the Energy Performance of Buildings Directive (EPBD) to promote improvements in the energy performance of both new and existing buildings. Scientific studies have shown that the world’s natural resources such as oil, gas and solid fuels generate omissions with the main one being CO2 which has a direct contribution to global warming. The Scottish Climate Change Bill has set ambitious targets of reducing CO2 omissions by 80% by 2050. Currently omissions from buildings account for approximately 40% of all CO2 omissions. The Scottish Government is introducing Energy Performance Certificates (EPCs) to comply with the Energy Performance of Buildings (Scotland) Regulations 2008. An EPC is a Certificate which states the energy efficiency of a building based on the standardised way in which a building is used. The Certificate is based upon the efficiency of the building and not the way it is used. CO2 ratings are showing in bands from A-G with A being the least polluting. The performance of the measured building is benchmarked against current Building Standards and recommended cost effective improvements. An EPC has a lifespan of 10 years and must be fixed to the building. If however major works are undertaken the building owners may choose to update the Certificate. If the vendor sells or rents the property the same EPC can be passed on if it has been produced within the 10 year period. Buildings with a total useful floor area of less than 50m². Temporary buildings with the lifespan of less than 2 years. The UK is committed to saving energy and reducing greenhouse gasses and this will continue. This is a global challenge and the UK has signed up to the Kyoto Protocol. Currently, one of the best ways to understand energy usage and where savings can be made is through the advice and information provided in Energy Performance Certificates. The UK’s commitment to the EPBD, enshrined in UK Law, forms a major part of the UK’s sustainability strategy and will remain so for the foreseeable future. The most recent EPC Regulations were signed off by The Scottish Parliament on 8th March 2016. This Legislation sets very modest energy performance improvement targets. However, the Legislation has introduced an Action Plan to accompany the EPC. All properties for sale/lease over 1,000m² will require an Action Plan. The Action Plan and EPC will form part of the marketing material available to prospective purchasers/tenants. Both the Action Plan and the EPC must be lodged on the Scottish Register. The Action Plan will be prepared by Section 63 Advisors. The Action Plan will specify improvement measures. The payback period of the improvement measures must not be greater than 7 years which will be measured through savings in energy bills. The payback period for boilers is 15 years. Improvement measures must be undertaken within 3½ years of the EPC being lodged. There are 7 prescriptive improvement measures within these new Regulations. The alternative improvement measures are optional by the Client/Owner/Section 63 Advisor and must have a shorter payback period than the prescriptive improvement measures. The fine for non-compliance will be £1,000.00. Buildings with a floor area less than 1,000m² (subject to sale/lease). Buildings that meet 2002 Building Regulations. Buildings improved by the UK Green Deal. Workshops or non-residential agricultural buildings with low energy demand. DEC – Display Energy Certificates – A DEC is a retrospective record of annual energy performance. It shows the energy performance of a building based on actual energy consumption (the ‘operational rating’) as recorded through metering or utility bills over a 12 month period. There is no legislation which mandates the production of a DEC for a building in Scotland. Production of a DEC will be triggered by decisions that a building owner makes, either in response to legislation or voluntarily. With the introduction of Section 63 Action plans, the building owner may opt for a DEC to comply with current legislation and as opposed to following through with the implementation of improvement measures highlighted in the Action Plan.